Much more is actually known about the brain than has made it out into the public consciousness and many areas I thought had some validity (iceberg, left/right brain, hard wiring) turn out to be very outdated. Excitingly, the newest theory touched on is that the brain and the body are one entity and electrical impulses and chemical secretions are actually tightly coupled. 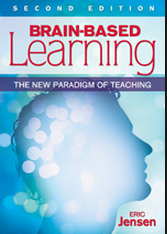 The explanations of how the brain actually works and how we learn are constantly put into the context of how to use this knowledge to help students learn faster, deeper and with greater plasticity. The more I read, the more I was struck by how much the sensory engagement and excitement our kids get every day from TV and computer games had its base in the brain science described. Better, I realised by understanding more about the positive effects on the brain; physical exercise, encouraging positive relationships, creating safe learning environments and opportunity to contribute, we can create a better learning experience for all our children in school. The ‘What This Means To You’ sections at the end of each chapter give really direct advice and useful ideas of how to create better learning opportunities within our classrooms.